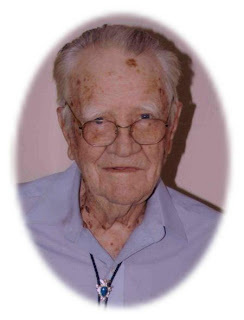 Francis Herde, 101, of Billings was the son of August Ludwig and Susan Susie George Herde. He was born Jan. 28, 1907, at Soldier, Kan., and died Sunday, Jan. 4, 2009, at St. Mary's Regional Medical Center in Enid. Francis moved to Billings in 1923. On Sept. 1, 1931, he and Ruth Morris were married at Howard, Kan. In 1938, Francis became a G.E. dealer and operated Herde's Electric in Billings, a business that later would achieve the distinction of being the oldest G.E. dealership in the nation. Francis attended Billings Christian Church. He was interested in antique clocks and pocket watches, collected antiques and enjoyed playing the French harp. The funeral will be at 1 p.m. Friday, Jan. 9, in the Christian Church in Billings. Kent Reubell will officiate. Interment will be in Union Cemetery at Billings under the direction of Dugger Funeral home of Billings. Memorials may be made to Hospice of North Central Oklahoma, c/o Dugger Funeral Home, PO Box 41, Billings, Okla. 74630. Francis is survived by two sons, Morris Herde and wife Dee of Kaw City and Dale Herde of Billings; two daughters, Clarice Everhart and husband Harley of Gig Harbor, Wash., and Loretta Myers of Blackwell; 14 grandchildren, 25 great-grandchildren; and two sisters, Lois Jane Russell of Stillwater and Doris Ratliff Ratcliff of Savannah, Ga. He was preceded in death by his wife Ruth who died in 1997; one daughter, Carol Caroll Lucille; his parents; four brothers and one sister. Condolences may be sent to www.duggerfuneralhome.com.